A helpful Chrome app called All-in-One Messenger brings together all your new messaging services. The modern world has a messaging problem: There are just too darn many apps and almost no one can get away with using just one. 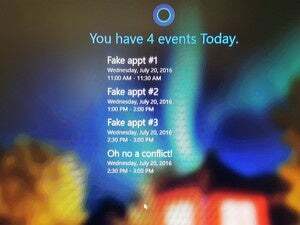 In many ways, we’re right back where we were in the late ’90s and early aughts before apps like Adium and Digsby consolidated AOL, Google Talk, MSN, and Yahoo into one window. Making matters worse this time around, many of today’s chat apps aren’t third-party friendly. Even if a chat platform doesn’t like third parties, many do have web apps, and that’s where a useful new Chrome app called All-in-One Messenger comes in. This Chrome app brings all those different messaging services into one place on your desktop with a tab for each. It’s not like the days of old where all your messaging contacts were in one list regardless of platform, but it still works. Since this is a Chrome web app it can also be pinned to your taskbar or launched from the Start menu independent of the Chrome browser. To get started, download and install All-in-One Messenger from the Chrome Web Store. Once the app is ready to go, click on any of the messaging services you want to use and sign-in to each platform’s web app. You can always get back to the list of messaging services by clicking on the settings cog in the upper-left corner. After you’ve signed in to a few services, you'll see that each one has its own tab that you can switch among at the top of the window. You may also have to dip into the settings of each web app you use to enable desktop notifications. Know, however, that since Chrome isn’t fully integrated with Windows 10 your desktop notifications won’t appear in Action Center. The All-in-One Messenger window also lacks a taskbar badge to let you know when new conversations are waiting for you. 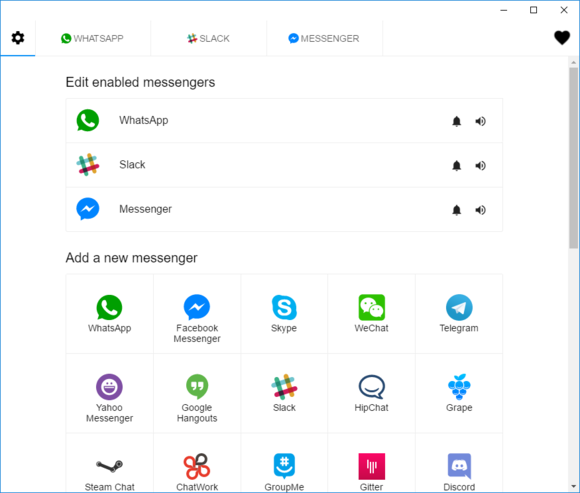 At this writing All-in-One Messenger supported more than 30 chat services such as Facebook Messenger, Google Hangouts, HipChat, Skype, Slack, Steam, Telegram, Tencent QQ, WeChat, and WhatsApp. It also supports XMPP for old-school chat services—not to mention direct support for ICQ. In its current form, All-in-One Messenger is on borrowed time. Google plans a long, slow death for Chrome Apps like All-in-One Messenger on Windows, Mac, and Linux. By late 2016, you’ll no longer be able to download and install the app, and on Windows the app will cease to function in early 2018. If All-in-One Messenger appeals to you, download it ASAP. Then once 2018 comes around, perhaps All-in-One Messenger will be available as a desktop app. If not, one alternative to keep an eye on is called Franz. 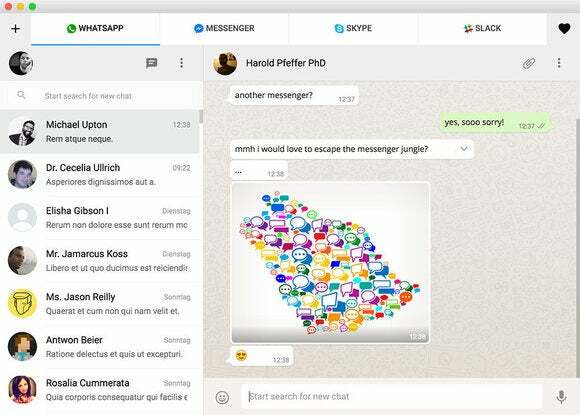 Currently in beta, Franz works similarly to All-in-One Messenger, but as a regular desktop program.